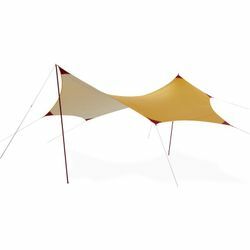 MSR Rendezvous Sun Shield 120 Wing Shelter. Updated for 2019. Updated with a UPF of 50+, the Rendezvous Sun Shield provides excellent sun, wind and rain protection at campsites and gathering areas. Available in two sizes, this uniquely designed, extremely stable shelter lets you set up a protected communal area at camp. The 120 version creates a 120-square-foot open area around campsites that offers protection from sun, rain, and wind for 1-4 people, and at 1.43 kg (3 lb 3 oz), it’s light enough for one person to pack and carry, even into the backcountry. With its more expansive 200-square-foot wingspan, the larger size is the ideal upgrade to your basecamping experience and perfect for sheltering up to a dozen people. Protected Coverage: Now featuring a UPF of 50+ for excellent UV protection, the Rendezvous™ Sun Shield 120 & 200 create nearly 120 square feet and 200 square feet of protected coverage at camp. Stable: The shelters' unique 7-point design pitches taut and remains stable in high winds. Versatile: Shelter height can be increased with the use of additional accessory poles.